In part I of this blog post I told you how supernovae type Ia have proven to be so important in defining today’s standard model of Cosmology. I did, however, leave out some important details so let’s get stuck right in. Type Ias don’t always explode with the same brightness. There seems to be some intrinsic variation – some are a little dimmer, and some are a little brighter. It’s important to note that this variation is relatively small when it comes to astrophysical events, but it still gets in the way of precision cosmology. We’re trying to measure the acceleration of the Universe, and that’s not an easy task. Nature, however, can sometimes be kind to us and it turns out that type Ia supernovae provide themselves the means to compensate for this small variation. What is neat (and lucky!) about light-curves, is that they are systematically different for supernovae that are dimmer or brighter. 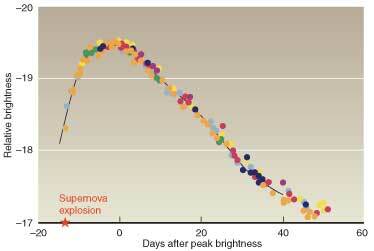 Brighter supernovae have broader light curves, and fainter ones have narrower, or shorter light-curves. In practice, what this means is that if we can measure the light curve of a supernova and how broad, or stretched it is, then we can correct for the small variations I mentioned at the start of this post and infer its real brightness – handy! It works pretty well, as you can see in these two images: the first one shows the light-curves for a bunch of supernovae and you can clearly see how some and brighter and some are dimmer. The second image shows how you can use the width of the light-curves alone to calibrate all supernovae to a single, intrinsic brightness. Supernova light curves before correction. 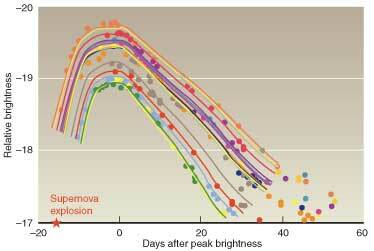 Supernova light curves after correction. We now have the so called standard candles, although many Astronomers would rightly point out that supernovae should rather be called standardisable candles. So is the problem solved? Once again – it depends on how well you want to play the game. Corrections like the ones I’ve shown you are pretty much standard right now, and they work to the precision required of present-day Cosmology experiments. They are definitely sufficient to establish the need for Dark Energy with a high level of confidence! Nonetheless, as we gear up to the next era of Cosmology experiments, Astronomers need to match technological advancements with new ways to analyse and interpret data. There are two main potential drawbacks in the light-curve approach. One is that this correction may be too simplistic in detail, and another is that light-curves are still not trivial to measure (they require a follow up of the explosion for days after the event). And this brings me to the paper I read last week, and which prompted this post (you thought I’d forgotten, uh? In truth I’ve been wanting to introduce Type Ia cosmology for a while!). Jordin et al., focus not on the light-curve of the supernova, but rather on its spectrum. I have a soft spot for this sort of approach for a variety of reasons, but primarily am I attracted by the possibility that a single shot of a supernova spectrum (instead of multiple images taking during the course of days to make up the light-curve) has the same information, the same potential to calibrate supernovae brightness. In practical terms this would be some serious advantage for future cosmology experiments. This is not the first time I hear about it, although peer reviewed papers are just starting to come out on this. As others have found, Jordin et al. find that a particular chemical signature in the spectrum of a type Ia – the Silicon II absorption feature – seems to be related with how stretched a light-curve is. Further study will be needed to find out if this Silicon II feature could in the future replace – or better, improve – light-curve corrections, but the results on this paper are at least enticing. Another thing I find attractive in this approach, is the fact they find in the supernova spectrum information about the galaxy in which it comes from. The work done to date (and I’ve done a fair bit on this, too) involves using the spectrum of the host galaxy to infer the likely properties of the environment that gave origin to the supernova, but this is not without trouble too. One of the reasons is because we can often only extract average information about a galaxy as a whole, and not about the specific bit of the galaxy the supernova comes from. The spectrum of the supernova has the potential to tell a far more direct tale, and I find that pretty exciting. I know.. it’s been a while. I’ll briefly mumble some apologies for having been so quiet here at the gutter (they’re heartily felt, though!) and quickly move on to the science. I realised, however, that there is a fair bit of background to cover before I can explain just how neat I think this paper is, so let’s do this one in parts, shall we? The paper that broke this silence is related to supernovae – mighty stellar explosions that are so bright they can often outshine the entire galaxy (made of hundreds of millions of stars!) in which they occur. Their extraordinary brightness means they can be spotted even when they occur a long way away – turns out this is very useful and we’ll get back to this later. A supernova explodes on the outskirts of a spiral galaxy. Most supernovae are directly related to the death of very massive stars, as they reach the end of their lives. These supernovae are traditionally called core-collapse supernovae, a term which recalls the physical process that drives the explosion – a collapse of the core of the star, caused by a lack of fuel that stops the nuclear heart form pumping. Stars of different sizes and chemical composition will ignite slightly differently, and some explosions will be brighter whereas others will be dimmer. But the type of supernova explosion this paper is concerned with has a very different origin, and they are called Type Ia supernovae. Their most important property, and one which rolled out the latest revolution in Cosmology, is the fact that they always seem to explode with the same brightness, or luminosity. Astronomers have nicknamed them standard candles, and we will see just how important this property came to be. To create one, Astronomers think you need a white dwarf – in itself the remnant of another star that reached the end of its life, but which wasn’t massive enough to create a core-collapse supernova. White dwarfs do not generate any energy through nuclear processes, and are extremely dense – so dense that matter has arranged itself in a state called electron-degenerate matter. We can go onto the details some other time, but the important thing to note is that there is a physical limit to how massive a body held up by electron-degenerate matter can be – any more massive and gravitational collapse will occur. This mass is around 1.44 times the mass of the Sun, and naturally white dwarfs have to sit below this limit. Imagine, however, a situation where a white dwarf may be close enough to a companion star such that mass transfer from the companion star onto the white dwarf can occur. What will happen is that as soon as the white dwarf reaches 1.44 solar masses, gravitational collapse with begin and the star will go supernova. The intrinsic limit of 1.44 solar masses means this mechanism will naturally produce explosions of similar brightness. We have never directly observed the progenitor of a type Ia supernova, but the fact that their brightness is incredibly uniform, coupled with the presence of certain chemical elements in these explosions that are known to also be present in white dwarfs bring incredible strength to this theory. So let us take a step back, and appreciate what we have here: a set of astrophysical events that are so bright that we can detect them a long way away, and for which we know the intrinsic brightness. For the rest of this post we will assume that we know how bright these explosions are exactly. We don’t – and that’s part II of this post – but it helps to assume we do for now. The great advantage is that you can compute how far light has travelled by measuring how much fainter a supernova appears to you, if you know how bright it is to begin with. This is very intuitive – if I was to hold two identical light bulbs at different distances from you and asked you which is nearest you, you’d be able to answer correctly just by seeing which appeared brighter. Going back to the supernovae – by taking the spectrum of the supernova itself or of its host galaxy, we can also measure its redshift. The redshift, in turn, tells us how fast an object is receding from us. Finally, the relationship between redshift and distance depends on the rate of expansion of the Universe. So by measuring redshift and distance independently, Astronomers can constrain the rate of expansion. In a Universe that is dominated by matter and that is currently expanding, we expect the rate of expansion to decrease with time. Think of how you’d expect the acceleration of a ball you threw up in the air to behave – it would set off with an initially velocity, and this velocity would slowly decrease until the moment it stopped and reversed its course to fall back down. Or, if you have unusually strong arms and could give it an initial velocity greater than the escape velocity, it would never turn back down but continue its journey into space, perpetually slowing down as it went. What Astronomers discovered, when they measured the rate of expansion of the Universe using the distances (from their apparent brighntess) and the redshifts (from their spectra) of type Ia supernova, was something quite different. They found that these explosions were significantly dimmer than what you’d expect from a matter-dominated Universe. The Universe, between us and these explosions, had expanded a lot faster than expected – to the point that the only explanation is that the expansion of the Universe is, in fact, accelerating. Going back to our previous analogy – it’s a little like our test ball brought out a little jet pack and shot off into space. This was truly unexpected – Astronomers call whatever is causing the expansion of the Universe to accelerate Dark Energy. Observations of type Ia supernovae in 1998 were the first evidence of Dark Energy, and it’s worth noting that other physical probes have since proved completely consistent with an accelerating Universe. And, to this day, type Ia supernovae are one of the most powerful probes to measure Dark Energy. The field has now moved on to trying to understand what Dark Energy is (rather than establishing its existence), which means measuring this acceleration to exquisite detail, and as a function of cosmic time. For that, we need incredibly precise standard candles – but that, is the matter of part II.